I hung my solo landscape photography exhibit at Leesburg Town Hall today in northern Virginia. This show contains photos that have not been previously displayed. 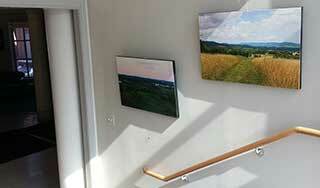 The photos displayed include scenes of Loudoun County pastures, farms, mountains and the Appalachian Trail. The photographs are a blend of framed and canvas prints. I’m honored to be showing on the first floor of town hall now through May. This show would not have happened if not for KD at Photoworks in Leesburg. She was kind enough to mention my work to a Leesburg Town art advisory board, which she is a part of. Thanks to you KD, for this and past showing opportunities. Her, and her husband Neil, just received recognition from the Town of Leesburg for their 35 years in business. Congratulations to both of them!